and two roundels. The compartments they form are filled with a variety of smaller motifs, from interlace patterns in green or blue to tiny knots and fleurs-de-lis. An intricately designed geometric pattern predominately in red and yellow. Previously thought to be from Almeria, Southern Spain. Samples of coloured threads from this object have been taken and are being analysed as part of a collaboration between the V&A and the Spanish Research project "Caracterización de als producciones textiles de la Antigüedad Tardía y Edad Media temprana: tejidos coptos, sasánidas, bizantinos e hispanomusulmanes en las colecciones públicas españolas" ("Characterization of Late Antique and Early Medieval textile production: Coptic, Sasanian, Byzantine and Spanish Muslim textiles in Spanish national collections") (HAR2008-04161) directed by Dr Laura Rodríguez Peinado, Universidad Complutense de Madrid, Dpt. de Historia del Arte I (Medieval). 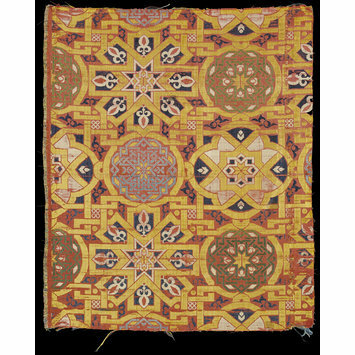 Middle East, Textile. 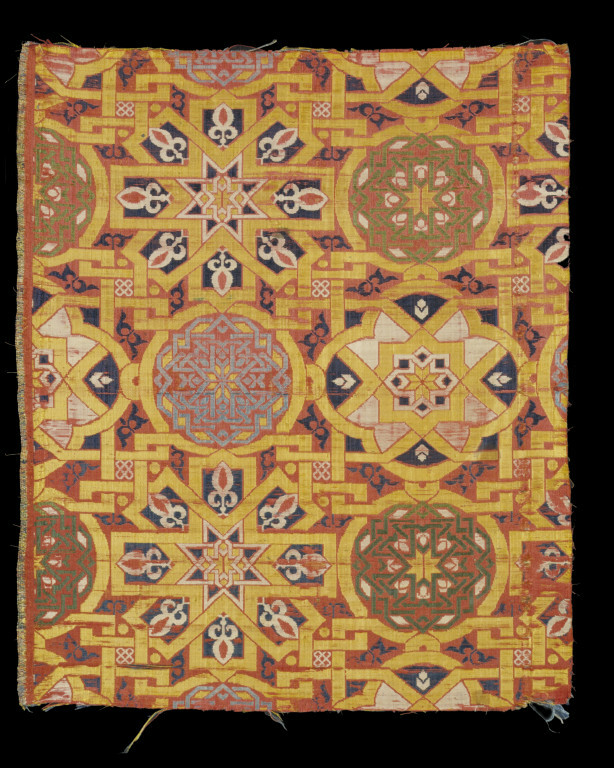 Silk lampas with a geometric pattern, south-east Spain (perhaps Granada), 1300-1400. The pattern, which appears continuous, has been adapted to the system of 'repeats' needed to produce a textile. Each design unit contains an eight-pointed star, a quatrefoil and two roundels. The compartments they form are filled with a variety of smaller motifs, from interlace patterns in green or blue to tiny knots and fleurs-de-lis. 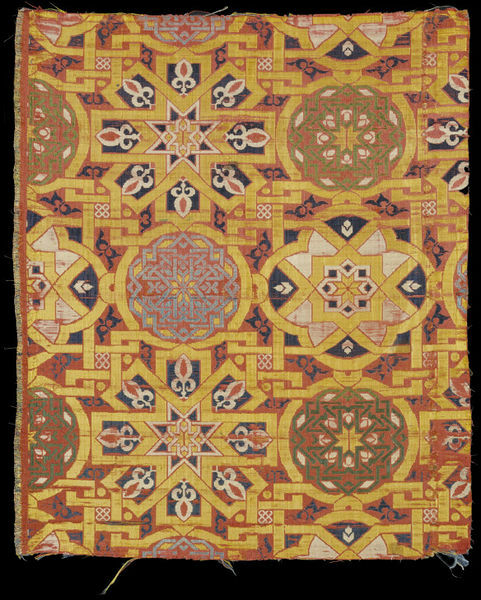 This pattern of interlaced geometric motifs is typical of the Hispano-Moresque silks produced in Spain during the period of Muslim role. Such silks were imported into other parts of Europe and used for both dress and furnishings. Heavy silk woven material on a red satin ground in expressive moorish style. [...] One can find such moorisch ornaments in Andalusian architectural tilework from the moorish period, especially in the Alhambra. The star shapes with the Fleur de Lis are characteristic for the Spanish moorish silk industry by the end of the 13th century. This piece was bought in Florence as a 'Dorsal bekleidung' (presumably a piece of cloth to cover the back) from a large wooden Maria statue.